Why have I started blogging again. As popular as the practice is, I like to think I am self aware enough to question my motives. Could it be for the ad revenue? No, that is in my wife's name and makes up part of the kids monthly trust fund payments. Could it be for fame? Not at all, I no more an exhibitionist than the next man. For your information, the next man is currently crushed against me on this London bound train. I think the reason I do what I do is simply to document. Everything that is happening to me since me children arrived has changed my life, changed my work, changed my home, changed even the way I think. It has matured me, sadly :). I feel the urge to lock each moment away somewhere. So I lock it here. How quickly you forget. Ripley is a boy now. As strange as it may seem to a non-parent but I never saw that coming. I don't think I did enough to document the little things, probably at the expense of a vaguely readable blog. but still. The sudden cry jolting you awake like a cup of cold water down your back. Walking through the twilight. Stubbing your toe on the bed frame. Carefully getting Jay back to sleep. Having to calm Ripley down as he is now awake. Falling back into bed and drifting back to slee <waaaaaaaah>. Everyone is awake. Was that 1 minute or 2 hours. You don't know. All that you do know is the next day will even more fun as it takes you 3 hours to come online. Jay and Ripley are laughing and giggling at breakfast. "Silly Daddy", laughes Ripley as I put milk in the sugar bowl. And there you go. Madly in love with them again. broken by Jayden. Quite accidental. He just stumbled and fell on it. before it could damage itself any more. most, Aibo would be it. ever get it fixed again. like a walking wifi laptop. around £1500. A bloody expensive accident. more depressing end to the day for someone elses family I fear. Damn, its been a while. But I'm back baby, yeah! children and so on. It is complex but here goes. another of his disjointed reactions. this blog, don't know why, but I do. 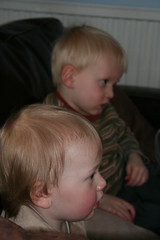 Dinosaurs and cbeebies (we limit the tv though). More will come very soon. Did you know that The river Danube empties into the Black Sea.